Stripes and floral ain't* nothing new (see other ways I've worn it here and here), but it's still one of my favorite combinations. I wore this outfit on Thanksgiving, not because it was perfect for eating a lot of food, or particularly festive or anything. It was just something I hadn't worn together before. It never ceases to amaze me how I can come up with "new" combinations for old clothes. I don't really think of myself as having a large wardrobe (see my closet), but the truth is that I probably have more clothes than 90% of the world. Crazy to think about isn't it? Can you tell I'm feeling pretty thankful and blessed these days? Blame the holidays. They get me every time. *I would never say ain't in a conversation, I just had to use it here. Please forgive me. I love mixing prints:) on my wishlist: sweaters!!! I love florals and stripes together! I love finding new ways to wear old clothes. This is a great combination! Love the floral and striped combo! Im seriously going to have to try it one of these days, you look fabulous! So cute! I always love stripes and floral together. You look fabulous! Love this look! I need to combine more florals and stripes. Thanks for the inspiration. 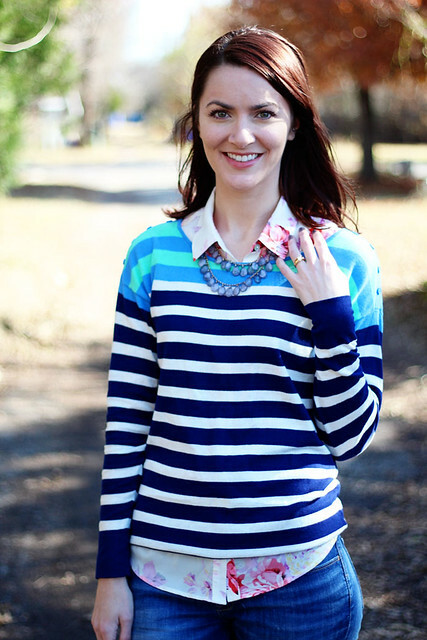 I love your striped sweater, and your blue necklace! 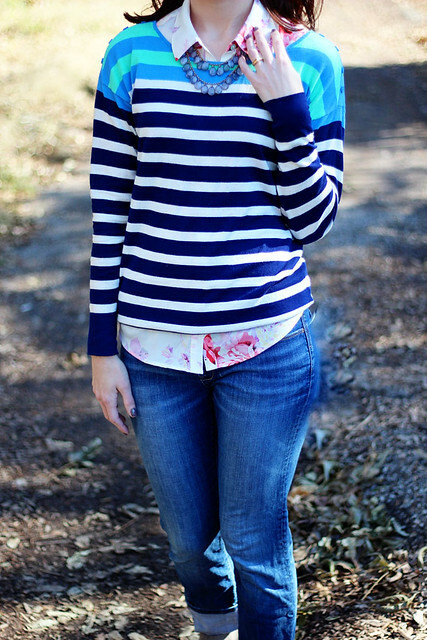 I love floral and stripes too, such a cute look! 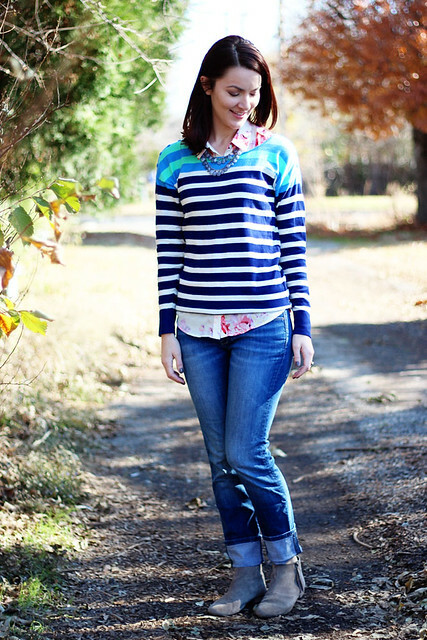 Love the stripes and floral together! It feels so fresh and happy compared to a lot of the darker colors I've been seeing in the blogging world (I'm completely guilty). Perhaps I should take a cue from you and try brightening my looks up a bit! 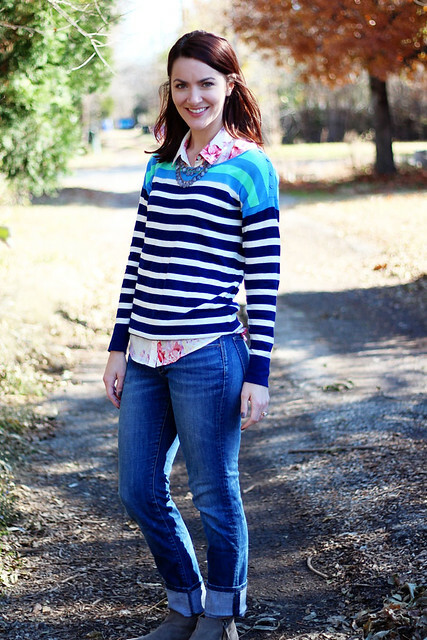 You look adorable in this casual look, love the stripes and floral mix. That floral shirt is so cute! It is such a great pop of color without being too much! Love the floral and stripes combination. I love stripes but who would have thought to pair it with floral?! You. Thanks for the daily clothing inspiration, you creative and modest all at the same time. I enjoy your posts. Honestly, I've never thought thought to wear stripes with floral. It's adorable! Love the idea of stripes on florals. too cute. i love the stripes and floral together! So fun! LOVE this combo! I get compliments every time I wear a floral scarf with my striped top, but have never thought of a floral shirt for underneath! Great idea! !